Three or four dozen young revelers turned up at the Edgartown Library on Saturday afternoon for the annual Mardi Gras Party. 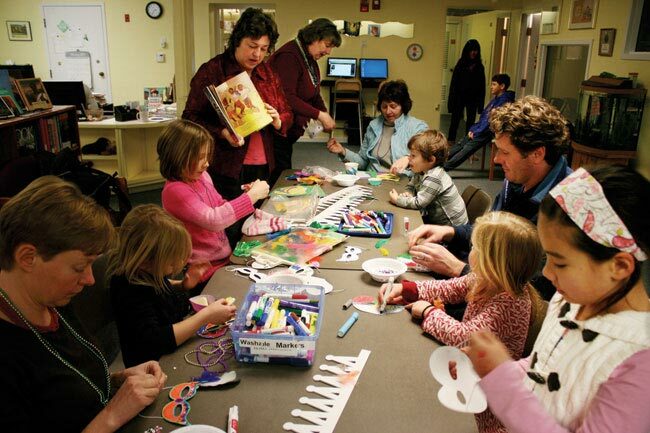 The brainchild of Children’s Librarian Debby MacInnis and her assistant, Donna Blackburn, the celebration has become a mid-winter institution. A long table was laid out with material for making masks and crowns, and the kids went at it with gusto, many of them aided by an attentive parent. Cookies and cider were offered, and many attendees tried their feet at the limbo and samba. The Mardi Gras colors — gold, green, and purple — were featured on both masks and cookies.